comScore has released a study which shows the top 10 pharmaceutical brand web sites by unique visitors. 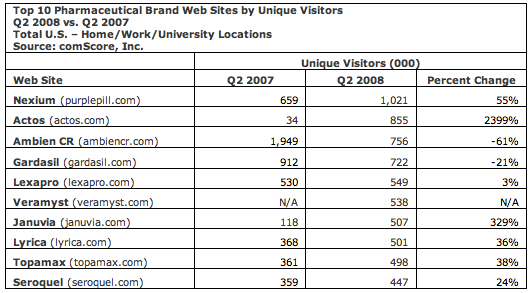 Their study compares website traffic changes from Q2 2007 to Q2 2008. Nexium was marketed more heavily during the quarter – running twice as much display advertising over its two closest competitors. This tactic appeared to vault Nexium (purplepill.com) into the top most visited drug brand name web site position during the second quarter of 2008. Collectively, the top 10 most visited drug brand name websites during the second quarter of 2008 received 6,394,000 unique visitors compared to the second quarter of 2007 where the same group of drug brands received 5,294,000 unique visitors.